Abigail Mussi picks out a toy after achieving a medical milestone. Ronald McDonald House Charities of Alabama has a fun way to help our families! Our Toy Store needs restocking after a busy summer. 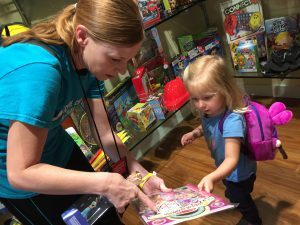 The Toy Store is where children – patients and siblings – who stay at the House can “shop” for a toy for free, thanks to the generosity of our donors. The kiddos can shop for a special treat when it’s their birthday or they’ve hit a major milestone, including meeting an important medical goal or if they’re ready to go home! We are in need of toys for all ages, from birth through 18. If you are moved to donate and have any questions or would like to coordinate a drop off, please contact Director of Family Programming April Dickerson at April.Dickerson@rmhca.org. Below you’ll find some ideas to get you started! Thank you for supporting the families we serve at RMHCA.